You’ve been on tour for almost three years now. How do feel you’ve settled into life as a professional? Yeah, it’s been good. It’s been steady progress, and, of course, it was great to get the win at the British Masters last year. Initially, I had a tough time, being too hard on myself, but then I figured out that that gives you strength, as well. I do think I work hard, but I think everybody works hard out on tour. I’ve learned a lot about what it takes to be a tour pro, whether it be the amount of practice you put it, fitness, diet, travelling plans and scheduling, all that kind of thing. I’ve definitely put the work in, but it’s dealing with it when it doesn’t quite pay off that is the hardest thing. 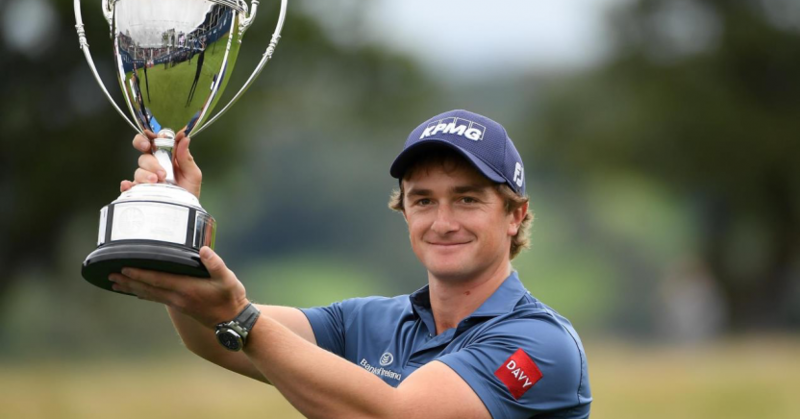 You hit the headlines in 2014, when you were leading the Open Championship after 54 holes as an amateur. Did that raise unrealistic expectations either from you or from others? Yes and no. My expectations definitely changed after the Open. I think before I played at Hoylake I was hopeful that I could make a living out of playing golf, but I wasn’t sure. I had had a decent amateur career, but I wouldn’t say that I was one of the best amateurs of my generation, by any stretch of the imagination. There were lots of assumptions made about how I was going to do after that, but the biggest thing that I took away from that was the confidence I got from knowing I could make a living playing golf. And once I knew that, I knew that I could get through qualifying school if I just played my own game. I didn’t have any expectations that I was going to win loads of tournaments, which a few people said, but at the end of the day, the only person’s expectations I really care about are my own. You won your first tournament at the British Masters last September. What was that week like? Winning the tournament gave me a huge sense of relief, more than anything, and proved to myself that I had it in me to get the job done. I went out on Sunday and really tried to win the tournament, rather than have someone hand it to me. That was the focus. Once I was in front, the plan was to just keep pushing, and see how many birdies I could make – so it was thrilling that I managed to pull it off. I think I’ve improved a lot mentally over the last year or so when I’ve found myself in those kinds of pressure situations. Back in 2016, I found myself needing to press forward on Sundays, trying to chase my card, and I struggled with it, but last year my scoring definitely improved on those weekend rounds. Before that, I felt like I was getting into a lot of top tens after two rounds, and then ended up finishing 30th or something. And all I was thinking about was making enough money to keep my card. Those tournaments are quite costly. There’s a difference in winning at the top; the prize money drops off quite quickly outside the top ten. That was getting in my head a little bit. And then, at the start of last year, I got into a better mindset on the weekend. I found what made me tick a little bit more. I got myself in the right frame of mind to try and play well, rather than not to play badly, if that makes sense. So I really kind of fed off that. Do you feel like you’ve stepped up another level of confidence now that you have a win to your name? Well, not so much. The confidence comes from how you’re playing on Thursday, if you know what I mean. But I definitely feel a lot more ready to close the door if I get myself in front, than I was beforehand. But going into the week just depends how you’re playing. If I’m not playing well, I’m not very confident. But right now, I am. You paired up with your good friend Gavin Moynihan to win the GolfSixes tournament at Centurion in May. What was that experience like? It was really a fun event, and it was great to play alongside Gavin again, as we’re good friends from our amateur days. Although there’s lots of noise and music, it’s still a professional golf tournament, and we were playing for money, as well as representing our country, so we were both determined to play well. Whenever you have the tricolour beside your name, it becomes a little bit more serious, so we were pleased to represent Ireland well, and get a nice trophy under the belt. Apart from the group match against France, I think we were three under par or better in every match through six holes. We just played really solidly all week. Gavin hit some amazing iron shots, and obviously the pivotal moment for us was him chipping in on the play-off against the South Koreans. But I’m not surprised – anybody who played with Gavin through amateur golf knows he chips in at least once a round, so he was due one. Being one of the younger Irish players on tour, have you had any advice from your more established fellow countrymen? When I was playing a practice round at the Open in 2014, I remember Graeme McDowell’s caddie offering me some advice on how to calm my nerves in front of big crowds. He said: ‘No matter how you start, the great players always find a way to settle themselves and put a score together, where other people might fall away’. Staying patient was definitely his message, and I’ve definitely tried to adopt that way of thinking. Then I remember Paul McGinley giving the GB&I team a pep talk ahead of the Walker Cup in 2015. He talked to us in quite a lot of detail about focusing on preparing for events, rather than worrying about outcomes. That has definitely stayed with me. You’re defending your British Masters title at Walton Heath next month, what are you thoughts on the course and how much are you looking forward to mounting your first defence of a title? Yeah, I’m really looking forward to it. With Justin [Rose] hosting, we should have a strong field. I’ve played Walton Heath quite a few times, most recently in June at the US Open qualifier, and really like it. I shot one-under over two rounds, so I didn’t quite set the course alight, but I like the way it sets up, and I think it suits my game. It depends what the weather throws at us, but there have been plenty of good scores there in the past in the tournaments I’ve played at, so I know we can get at it. I’m not putting too much pressure on myself as the defending champion, and will try and just treat it like any other week, and hope that I can put four good rounds together. Hopefully, we’ll get some good crowds and, if Europe have managed to win the Ryder Cup, the atmosphere we’ll be even better! The Sky Sports British Masters is being held at Walton Heath Golf Club in Surrey from October 11-14. For tickets visit, www.europeantour.com.